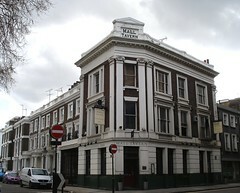 It changed hands in spring 2010, and is now run by the people behind the Stag in Hampstead and the Regent in Kensal Green. For information on its previous incarnation, see Evening Standard review from 2007 or Kake's comments on Flickr. The interior is divided into two parts, and as with the old incarnation the front room seems more aimed towards drinkers, while the tables in the back room are laid with glasses and cutlery. Three handpumps for real ale have been installed on the bar, and they now serve British food rather than the pan-European menu previously available. Kake and Ewan visited on a Wednesday early evening in November 2011. There were a few other customers, but plenty of free tables. Music was playing, not too loud and fairly blues-based in style. The lighting was quite low, too low really for comfortable reading, even though a couple of customers were attempting to read newspapers. Three real ales were on: Otter Bitter (£3.60/pint), Sambrooks Wandle, and Sharp's Doom Bar. They also have a fairly substantial wine list, from which Kake (a relatively clueless wine-selector) managed to choose a very enjoyable glass of white. Tap water was happily provided, and came in a carafe. Food is served from noon-10pm every day, according to their website as of late 2011. It's available in both areas of the building; in the front bit you order and pay at the bar. Kake tried the mushroom and chestnut pate (£5.50). This was pretty good, with clear care taken over preparation and presentation. The pate itself had a nice loose texture and plenty of flavour. It was topped with microgreens and marinated mushrooms (possibly shimeji), and served with a buttery puff pastry semicircle which looked good but was sadly too easily shattered to be of much use in eating the pate. However, some very thin and crisp toasted bread (rye?) was supplied on the side, in a generous enough portion that I only managed half of it. Kake's verdict: I quite liked this place before the change of management, and I still like it now. I would happily pop in for a drink and a snack if I was passing, and would even make a special journey (though given the lighting issue I'd prefer to visit in the daytime). Last visited by Kake and Ewan, November 2011. Last edited 2017-06-04 15:05:33 (version 20; diff). List all versions. Page last edited 2017-06-04 15:05:33 (version 20).